^ Williams Textbook of Endocrinology, pp. 103-134. ^ Handbook of Neuroendocrinology, pp. 7-13. 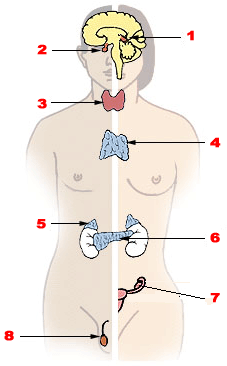 ^ The Endocrine System - An Overview 1998. Kronenberg, Henry M.; Meme, Shlomo; Polonsky, Kenneth S.; Larsen, P. Reed (October 26, 2007). Williams Textbook of Endocrinology (11 ed.). Saunders. p. 1936. ISBN 978-1-4160-2911-3. http://www.elsevierimages.com/product/9781416029113/index.htm. Fink, George; Pfaff, Donald W.; Levine, Jon (Dec 13, 2011). Handbook of Neuroendocrinology (first edition 2012 ed.). Elsevier Inc.. p. 894. ISBN 978-0-12-375097-6. http://books.google.co.jp/books?id=Disx7IryLxUC&printsec=frontcover&source=gbs_ge_summary_r&cad=0#v=onepage&q&f=false. Susanne Hiller-Sturmhöfel, Ph.D.; Andrzej Bartke, Ph.D. (1998). “The Endocrine System - An Overview”. Alcohol and Hormones 22 (3): 153-164. http://pubs.niaaa.nih.gov/publications/arh22-3/153.pdf 2012年6月1日閲覧。.